The ratings wars for the big networks are in full swing — and Nielsen just said the numbers are wrong, according to CNN Money. Friday, according to C/Net, Nielsen Global President Steve Hasker said he believed a drop in prime-time broadcast television ratings this fall is the result of people watching content on devices other than televisions. Nielsen has long struggled with how to count viewing that takes place off the television, even as video on mobile devices has proliferated. These difficulties have clogged how much content is available on devices, since networks are reluctant to make their content available live on Internet-connected devices without any promise that viewing on iPads or iPhones will count toward the all-important rankings that set advertising rates. This year, Nielsen began measuring and collecting data about viewing on other devices. According to Broadcasting&Cable, David Poltrack, chief research officer at CBS, said it was clear that ABC benefited from the error. Poltrack said that when the new numbers come out, in cases where ABC shows added three or four tenths of a percentage point, three of three of those will likely go away. As for news programs, TV Newser reports, the outcome of the evening news battle between “NBC Nightly News” and ABC’s “World News Tonight” could be affected. 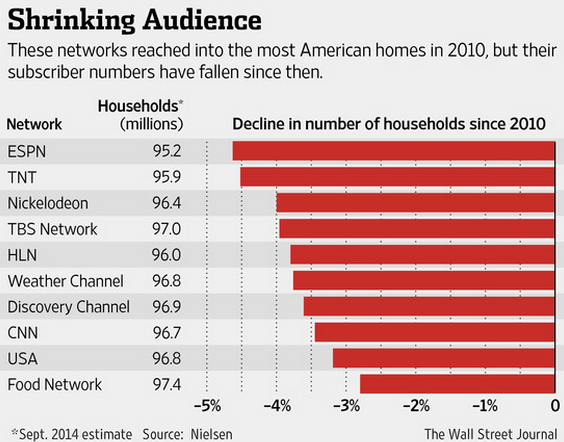 NBC fell behind ABC during one week in the summer of 2013 in the demo. Then in April — not long after the Nielsen errors began — the long-dominant NBC program began falling behind ABC. Since the week of June 30, “World News” has been a consistent, though narrow, No. 1 in the demo. Then last week, the ABC broadcast broke “Nightly’s” five-year winning streak among total viewers. On the 12th in 1937..."Mr. Keen, Tracer of Lost Persons" debuted on the NBC Blue network, where the series continued until 1947 then moved to CBS. Bennett Kilpack was the first actor to play Mr. Keen. Phil Clarke stepped into the role late in the run. The series continued on the air until April 19, 1955. 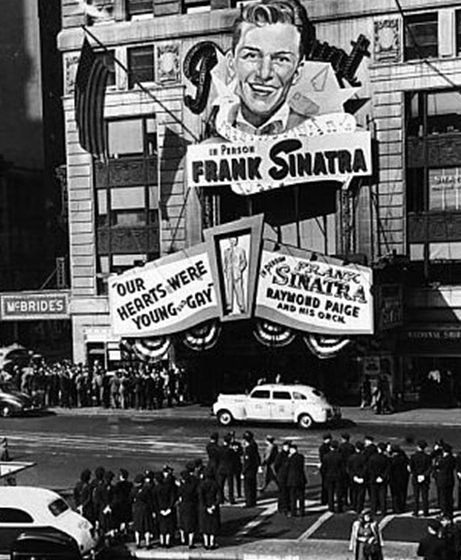 On the 12th in 1944...What would come to be known as the "Columbus Day Riot" takes place in New York City, when 35,000 hysterical teenage girls crowd the Paramount Theatre for a chance to see the return of crooner Frank Sinatra. The crowd of teen "bobbysoxer" girls halt traffic in Times Square, refuse to leave between shows to the extent of fainting from hunger, and ruin several seats in the theater when several urinate there rather than take a chance on going to the bathroom. On the 12th In 1950…After a 15-year run on radio, "The George Burns and Gracie Allen Show" made its television debut on CBS, where the series continued through September of 1958. On the 12th in 1955...Chrysler introduces the world's first in-car sound systems -- vinyl record players, complete with an assortment of classical records, mounted under the dashboard. 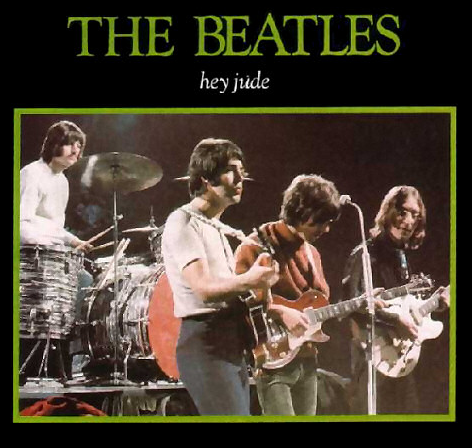 On the 12th in 1968...The Hot 100..The count had reached three for weeks at #1 for "Hey Jude" by the Beatles. Jeannie C. Riley was a distant second with "Harper Valley P.T.A." and "Fire" from the Crazy World of Arthur Brown was third. O.C. Smith remained at 4 with "Little Green Apples". The rest of the Top 10: "Girl Watcher" from the O'Kaysions, the Grass Roots had their biggest song move from 17 to 6--"Midnight Confessions", the Vogues climbed into the Top 10 with "My Special Angel", the Bee Gees were at 8 with "I've Gotta' Get a Message To You", Gary Puckett from Twin Falls, Idaho & the Union Gap moved from 25-9 with "Over You" and Clarence Carter dropped with "Slip Away". On the 12th in 1969...the "Paul is Dead" hoax began when Tom Zarski, a student at Eastern Michigan University, calls WKNR in Detroit, MI, and informs DJ Russ Gibb on air of the rumor that Paul McCartney died in a car crash, perhaps as long ago as 1966. Zarski tells Gibb that by playing a section of the band's "Revolution 9" backwards, a clue emerges: the phrase "Turn me on, dead man." Gibb proceeds to do just that. Listeners are stunned. Two days after the WKNR broadcast, The Michigan Daily published a satirical review of Abbey Road by University of Michigan student Fred LaBour under the headline "McCartney Dead; New Evidence Brought to Light". It identified various "clues" to McCartney's death on Beatles album covers, including new clues from the just-released Abbey Road LP. As LaBour had invented many of the clues, he was astonished when the story was picked up by newspapers across the United States.WKNR-FM further fuelled the rumour with a special two-hour program on the subject, "The Beatle Plot", which aired 19 October 1969 (and in the years since on Detroit radio). In the early morning hours of October 21, 1969, Roby Yonge, a disc jockey at New York radio station WABC, discussed the rumor on the air for over an hour before being pulled off the air for breaking format. At that time of night, WABC's signal covered a wide listening area and could be heard in 38 states and at times, other countries. Later that day, the Beatles' press office issued statements denying the rumour which were widely reported by national and international media. Various 'clues' were used to suggest the following story: three years previously (on November 9, 1966), McCartney, after an argument during a Beatles' recording session, had angrily driven off in his car. He had crashed it and died as a result. To spare the public from grief, the Beatles replaced him with "William Campbell", the winner of a McCartney look-alike contest. 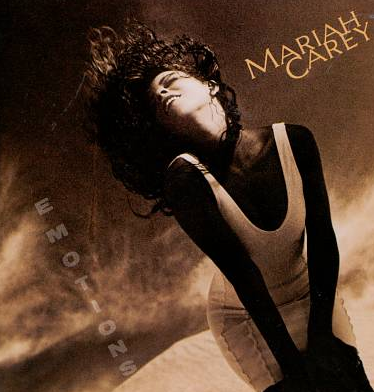 On the 12th in 1991...The Hot 100.."Emotions" became Mariah Carey's fifth consecutive #1 song to begin her career. "Good Vibrations" from Marky Mark & the Funky Bunch was #2. Natural Selection's "Do Anything", Color Me Badd with "I Adore Mi Amor" and Karyn White's "Romantic" trailed. The rest of the Top 10: "Something To Talk About" by Bonnie Raitt at #6, Extreme's follow-up to "More Than Words"--"Hole Hearted" was #7, Firehouse slowed things down with "Love of a Lifetime", Boyz II Men were on their way down with "Motownphilly" and Aaron Neville's remake of the Main Ingredient hit "Everybody Plays the Fool" was at #10. 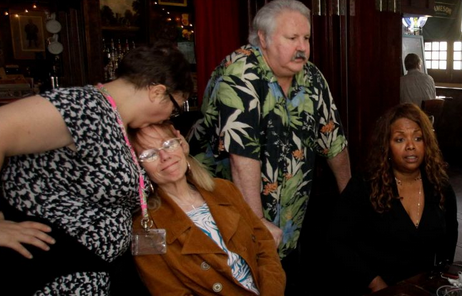 On the 12th in 2012...Disc jockey (KLIF-Dallas, KILT-Houston, WHK-Cleveland, WXYZ-Detroit, WNEW and WNSW-New York, WICC-Bridgeport, WAVZ-New Haven) Russ "The Weird Beard" Knight died. Alpha Media of Portland, OR announced today they have entered into a definitive agreement to purchase radio stations from Buckley Broadcasting of California and Buckley Communications. The Alpha Media portfolio will grow to 74 stations, upon closing. Larry Wilson, Chairman of Alpha Media will add the Buckley clusters to the seventy stations (which includes two under LMAs) currently in the Alpha Media portfolio when all pending deals are completed, bringing the total number of stations owned by Alpha Media to seventy-four. This transaction will be filed with the Federal Communications Commission shortly and is subject to their approval. Richard A. Foreman Associates, Inc. was the broker for Buckley Broadcasting and Buckley Communications. The biggest U.S. cable-TV channels are experiencing a troubling trend: Their reach into American households is shrinking, reports The Wall Street Journal. Over the past four years, the top 40 most widely distributed channels in 2010—household names like CNN, ESPN and USA—have lost an average of 3.2 million subscribers, or more than 3% of their distribution, according to a Wall Street Journal analysis of data from measurement firm Nielsen. Some in the industry point to consumers who are “cutting the cord,” ditching their cable and satellite-TV connections in favor of more affordable online video options like Netflix and Hulu. But the numbers don’t add up. Last year the pay-TV industry lost 166,000 subscribers, according to research firm MoffettNathanson LLC. While that was the first annual decline on record, it isn’t enough to account for the subscriber declines of the biggest cable channels. Indeed, the data and interviews with a range of cable-TV industry executives suggest that something else is going on: Many consumers aren’t so much cutting the cord as shaving it. A growing share of pay-TV customers are signing up for smaller, cheaper bundles of channels that cost anywhere from $10 to $50 a month and don’t include popular channels like TNT, USA, ESPN, CNN, Fox News, Disney Channel and Discovery Channel, the industry executives say. 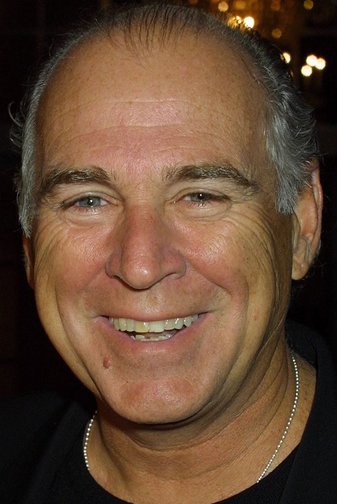 Spotify is too cheap when it comes to paying artist royalties, according to Jimmy Buffett. The NY Post reports Buffet told Daniel Ek, chief executive of the music-streaming company, that artists deserve a bigger cut of the company’s revenues. “Do you see anything in your future where we might get a raise directly from you as opposed to going through the bulls–t you have to go through to deal with a label these days?” Buffett asked Ek during the question and answer segment of a media panel here. He took the mic during the Q&A session of the second panel of the morning, “Disrupting the Music Business,” at the Vanity Fair New Establishment Summit. Ek said Spotify is committed to transparency and is working to better show how streaming is financially benefiting each artist. One benefit of the new tracking system is that payouts will be done more frequently, rather than just on an annual basis, he said. President Barack Obama says his administration "expects" that the Federal Communications Commission will not allow Internet service providers to offer multiple tiers of service, according to The Huffington Post. Speaking at a town hall in Santa Monica, California on Thursday, Obama reiterated his support for net neutrality, or the principle that all Internet data and traffic should be treated equally. Asked by a questioner at start-up incubator Cross Campus for his thoughts on the issue, Obama said he opposes paid prioritization of Internet service. "I made a commitment very early on that I am unequivocally committed to net neutrality," Obama said. "I think it is what has unleashed the power of the Internet and we don't want to lose that or clog up the pipes." He continued: "My appointee, [FCC Chairman] Tom Wheeler, knows my position. I can't now, that he's there, I can't just call him up and tell him exactly what to do. But what I've been clear about, what the White House has been clear about is that we expect whatever final rules to emerge to make sure that we're not creating two or three or four tiers of Internet. That ends up being a big priority of mine." Liberty Media CEO Greg Maffei on Thursday gently tweaked those at SiriusXM Radio who spurned a buyout offer earlier this year by pointing out the stock price of the satellite firm, and also didn't rule out pursuing SiriusXM in the future, according to The Hollywood Reporter. 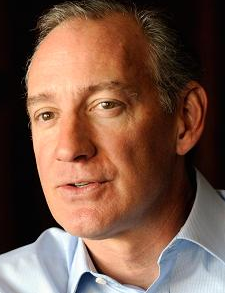 "Sirius holders wish they took the deal," Maffei said at the FBR Digital Media Thought Leaders Conference in New York. Shares of SiriusXM were trading at $3.28 on Thursday, whereas Liberty, which already owns more than half the company, offered to pay $3.86 a share for the stock it didn't own. SiriusXM shareholders balked, and Liberty withdrew the offer seven months ago. Maffei added that while he'd like Liberty to fully absorb SiriusXM, he's satisfied with the position his company already has and he likes the radio company's growth prospects. 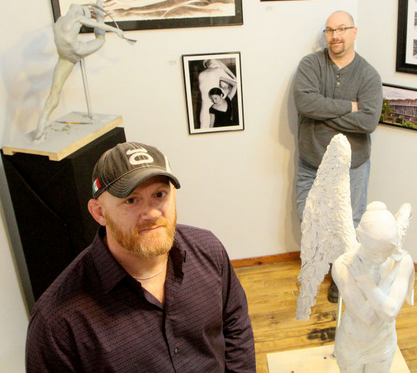 Less than three months after they were ousted from their radio morning show homes by a format change, Dave Levora and Darren Pitra are back behind the mic. But this time they're onlinem according to the Quad City Times. 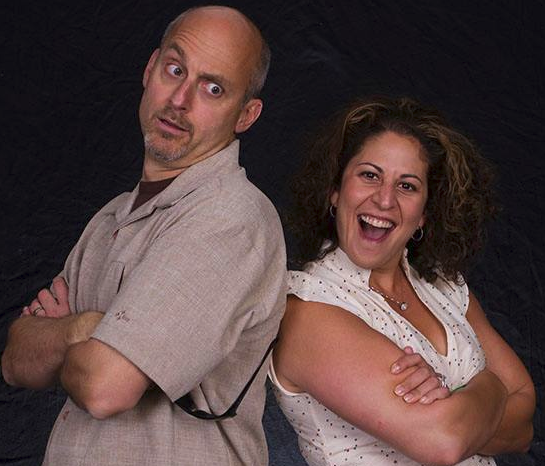 Morning-show co-hosts for more than 10 years at KBOB 104.9 FM before its format changed to become a country station called "The Hawk," the duo is dishing up two stations online at their new NachoRadio.com website. "Getting booted off terrestrial radio means we have freedom," Levora wrote on the NachoRadio site. "The freedom to do whatever we want without limitations. No limitations on the playlist or with an FM signal that, let’s face it, presented us all with certain challenges." Nacho Radio is introducing two stations: Planet ALT, an alternative format that resembles a continuation of "The Planet," the FM station where Levora was the morning-show host from the 1990s until a few months into the new millennium; and Solid, an active and modern rock format that's built for the fans who miss "the Quad-City Rocker." There also will be a live one-hour — give or take a few minutes — Dave and Darren podcast at 9 a.m. weekdays, as well as "best-of" segments. President Obama Wednesday renominated FCC Commissioner Michael O’Rielly for a full five year term. 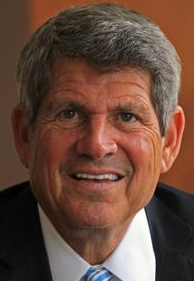 While not exactly using those words, Emmis CEO Jeff Smulyan basically said as much. On Thursday's conference call with financial analysts, Emmis CEO continued his upbeat appraisal of the 2Q earnings report. Smulyan said the quarter was interesting as "the performance of the radio industry as a whole was very challenged and I guess the highlight of what I want to say today is there seems to be much better news on the way." "We are happy at Emmis because once again for now four and a half years we have outperformed our markets. This is another quarter our radio revenues based on Miller Kaplan were down 1.7% for the quarter our markets were down 5.1%. So, that’s good news and obviously bad news is they are – we’re outperforming but our sector certainly is challenged. He also stated there are encouraging signs for Q3 and Q4 is looking "dramatically better". NextRadio: "We now have interactive activity from just about every major company. I think all of the top-20 are either interactive now or in the final stages of doing it. We’ve had support for the Sprint deal from just about every major company. The top selling five companies either had checks or commitments of time for I think 70 of them. As I have said in my 40 years in the industry I have never seen the industry come together for something as much as this." Summer Slowdown: "We do believe that it’s an industry that needs a catalyst. It’s quite remarkable to see the disconnect between an industry which still gets 93% of the population every week and on a six plus basis that’s 275 million people. And pretty significant time spent listening with the view sort of the public is, oh my gosh, is radio over? "We’ve always said that radio needs a catalyst and that’s why we are so bullish about NextRadio. Didn’t take a rocket scientist to see that if you can turn on the chip in 300 million smartphones as well as make a dashboard come alive with the interactivity of NextRadio based on the research we’ve seen, based on all the metrics we’ve seen, that alone would be the catalyst to change the perception of radio." 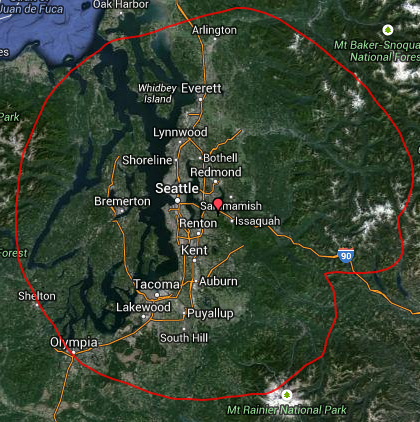 Radio Consolidation: "We’re always open to ideas. The biggest challenge again is that an industry has not shown growth characteristics has challenged in excess to capital. So for that reason it’s going to be tougher but yes I think, and we’re obviously very close to the Beasley people and very close to the CBS people and I was thrilled when I told Caroline and George and Dan and Scott Herman that was a win-win for everybody and a very, very good deal. And whether our situations like that where clearly that made sense for CBS to increase its stake in Philadelphia and Miami and it clearly made sense for Beasley to have very strong clusters in Charlotte and Tampa and the other markets it was a win-win." Twitter's head of news, Vivian Schiller, has quit her job at the company less than a year after she took the role, The Verge reports. Schiller joined Twitter as the social media platform started to move more aggressively into journalism at the end of last year, building new alerts for breaking news, and attempting to nurture relationships with the media industry. She announced she was stepping down as Twitter consolidates its global media division under new boss Katie Jacobs Stanton. In her three-tweet resignation, Schiller called her time at Twitter "a fascinating experience." She came to Twitter from NBC, but her resume also includes stints at NPR and The New York Times. In her post, she explained why she was making the leap from "digital person in a media company" to "the media person in a tech company," saying that she had faith that Twitter can change the world for the better. Katy Perry will perform at the Super Bowl XLIX halftime show, Variety reports. In an interview, she also said she’s “not the kind of girl to pay to play the Super Bowl.” The NFL reportedly asked Perry, Coldplay and Rihanna if they would be willing to pay to play the colossal ratings event but were given the cold shoulder. The 2015 Super Bowl, held in Glendale, Arizona, will air Feb. 1 on NBC. Last year’s Super Bowl between the Seattle Seahawks and Denver Broncos was the most-watched TV event ever, drawing a staggering 111 million viewers. Other performers at the Super Bowl Halftime Show in recent years have included Beyonce and Destiny’s Child in 2013, Madonna (2012), the Black Eyed Peas, Usher and Slash (2011), The Who (2010), Bruce Springsteen (2009), Tom Petty & the Heartbreakers (2008), Prince (2007), The Rolling Stones (2006) and Paul McCartney in 2005. The younger millennials are the digital natives, a strange species first identified back in the last century. Now it’s out of high school, in college and in the workforce. And accoridng to Nieman Lab, digital natives don’t see much use in print, especially packaged news as stale as day-old bread. Move up the age ranks into the early thirties, and Nieman can see millennials’ uneven reading habits relating to legacy media. 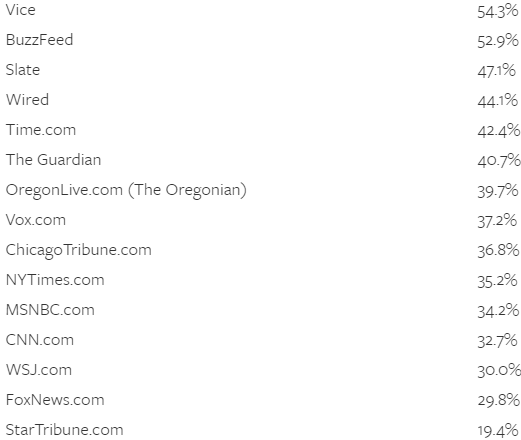 Prepared with data from Comscore, Nieman has ranked 15 representative news sites by the percentage of their unique visitors who are millennials. The Wisconsin women’s hockey team will once again team with iHeartMedia in Madison to air 11 regular-season games this season. Games air in the Madison area on WIBA 1310 AM, WTSO 1070 AM and WXXM-92.1 FM with Reid Magnum serving as the play-by-play announcer. Joining Magnum in the booth this year is former UW standout Madison Packer, who was a part of UW's 2011 NCAA title team and tallied over 100 points during her Wisconsin career. Three of Wisconsin’s four regular season matchups against No. 1 Minnesota will be broadcasted, including the Jan. 10-11 series in Minneapolis. The first broadcast of the year will take place on Sunday as No. 2 Wisconsin entertains Ohio State in a 1 p.m. tilt at LaBahn Arena. That game airs on The Big 1070 (WTSO-AM). 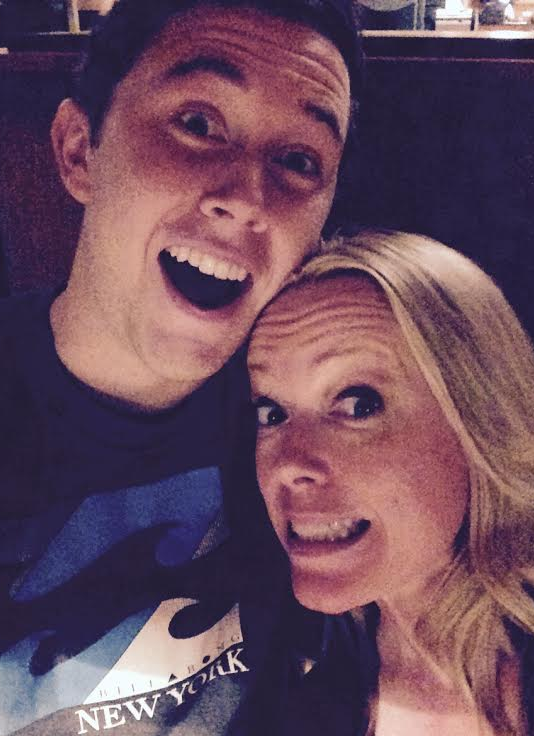 Lia Knight, host of the Westwood One-syndicated The Lia Show, hung out Wednesdayt night with “American Idol” winner and country singer Scotty McCreery on the eve of his 21st Birthday. He turned 21 today! 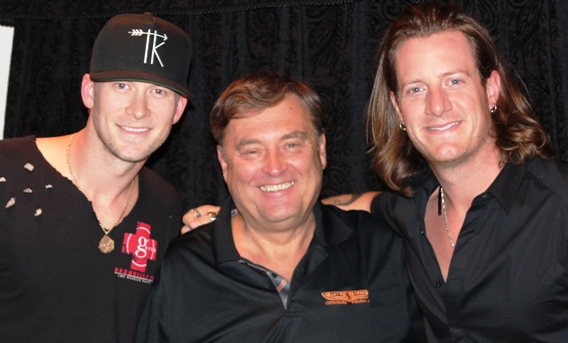 Happy Birthday, Scotty! CMA Vocal Duo Florida Georgia Line co-host Westwood One’s Country Countdown USA With Lon Helton this weekend, to talk about their new album "Anything Goes," their tour with Jason Aldean, and their upcoming concert at the Florida-Georgia football game. The guys actually have three songs in this week's Top 5, and they explain how it happened. They also recall seeing a Garth Brooks concert in Nashville back in 2010. 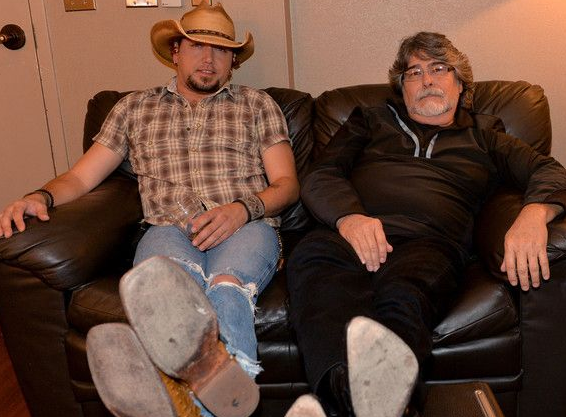 This week’s on Westwood One’s Country Gold With Randy Owen, guest DJ Jason Aldean joins his hero to play his favorite country classics. Songs on Jason's classic country list include "The Ride" by David Allan Coe, "Guitar Town" by Steve Earle, and "Swingin'" by John Anderson. Plus Jason's duet with Randy on Alabama's hit "Tennessee River." KUPL 98.7 FM The Bull’s Buckwild Saturday Night launches into National Syndication this weekend! The show is a high energy, interactive and LIVE Party Show for the Country Format airing LIVE Saturday Nights 7pm-12am and is hosted by KUPL (98.7 The Bull) Portland’s Afternoon Host and APD/MD, B-Dub. “We’ve been running a soft launch in Portland since April, and now we have 8 great sounding radio stations ready to crank up the energy level on Saturday Nights, I can’t wait!” said B-Dub, Afternoons, APD/MD on 98.7 The Bull and Host of Buckwild Saturday Night. Buckwild Saturday Night is currently airing on the following stations; Alpha Media KUPL (98.7 The Bull)/Portland OR, Alpha Media WLFV 93.1 FM The Wolf in Richmond VA, Alpha Media WGBL 96.7 FM The Bull) in Biloxi-Gulfport MS, Alpha Media WUBB 106.9 FM Bob in Savannah GA, Alpha Media WXCL 104.9 FM The Wolf in Peoria IL, Bicoastal Media KRWQ 100.3 FM Q100.3 in Medford OR, Leighton Broadcasting KZPK 98.9 FM Wild Country 99) in St Cloud MN and Alpha Media WHKX/WHQX Kicks 106.3 /107.7 in Bluefield WV. UPDATE 10am SATURDAY: Due to inclement weather, this event has been postponed until Sunday 1pm to 5pm. Cumulus New York stations WABC 770 AM , WPLJ 95.5 FM, WNSH 94.7 FM NashFM, and the new WNBM 103.9 FM Radio 103-9 will host the 2nd Annual Fall Family Festival and Auto Expo this Saturday, October 11th from 11am to 3pm at Overpeck Park in Ridgefield Park, New Jersey. The festival will offer a fall food court with some of the best restaurants in Bergen County, and a wide array of exhibits from local vendors, farms and pumpkin patches. There will be hayrides, a petting zoo and several activities for kids and families. The day will end with the “The Best of Show” contest, featuring some of the most unique cars and trucks from the tri-state area. 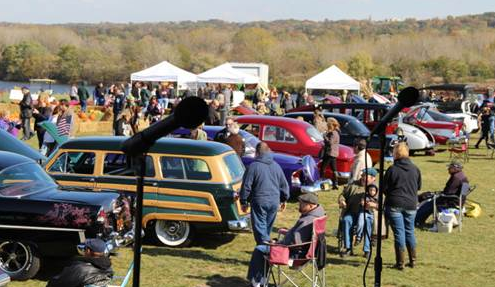 It will include three categories – antique cars, muscle cars, and trucks. Attendees are encouraged to vote for their favorites in each category on site. 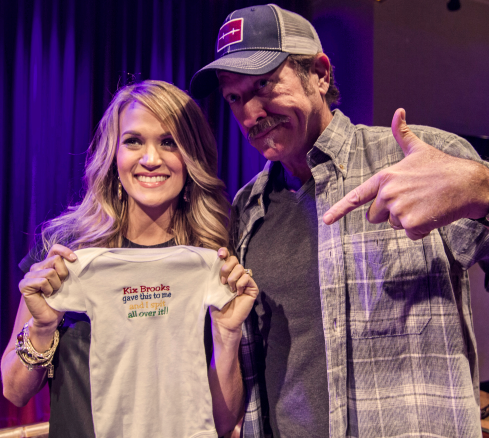 Carrie Underwood visited the NASH campus in Nashville last week and received a baby gift from American Country Countdown/Kickin' It with Kix host Kix Brooks. 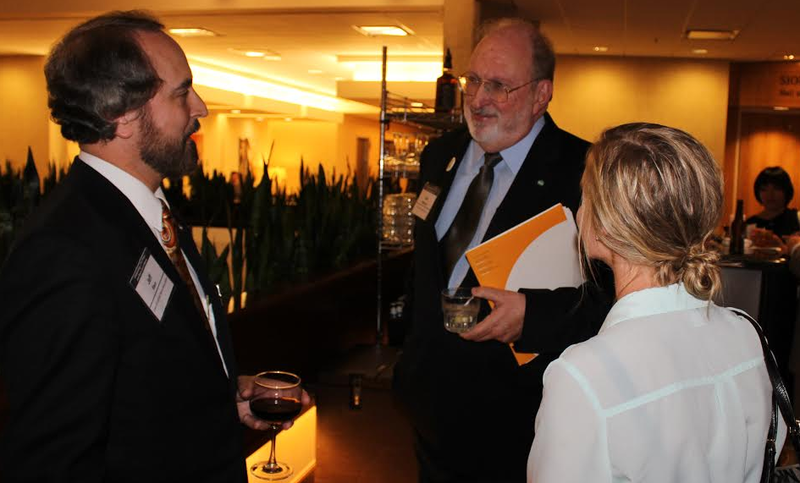 Last week, Westwood One-syndicated talker Jim Bohannon, host of “The Jim Bohannon Show” and “America in the Morning,” was the guest speaker at the IowaWatch Free Press Champion Awards, sponsored by The Iowa Center for Public Affairs Journalism. The event honored two Iowa journalists for promoting and showing, by example, the benefits of transparent government in Iowa. You can read more here. iHeartMedia is ready to celebrate the holiday season with the iHeartRadio Jingle Ball 2014 Tour. In 1902...Kalamazoo, MI, mandolin maker Orville Gibson founds the Gibson Mandolin-Guitar Mfg. Co, Ltd. In 1936 it would create the first commercially successful electric guitar. Gibson began in 1894 in his home workshop in Kalamazoo, Michigan. With no formal training, Gibson created an entirely new style of mandolin and guitar, with tops carved and arched like the top of a violin. His creations were so different that he was granted a patent on his design. More importantly, they were louder and more durable than contemporary fretted instruments, and musicians soon demanded more than he was able to build in his one-man shop. On the strength of Gibson's ideas, five Kalamazoo businessmen formed the Gibson Mandolin-Guitar Mfg. Co., Ltd., in 1902. Within a short period after the company was started, the board passed a motion that "Orville H. Gibson be paid only for the actual time he works for the Company." After that time, there is no clear indication whether he worked there full-time, or as a consultant. Julius Bellson states in his 1973 publication, The Gibson Story, that "Orville Gibson had visions and dreams that were considered eccentric." In 1932..."Betty & Bob" premiered on radio. In 1959...We all have career choices to make. On this date, Ken Brown decided to leave the Quarrymen, leaving John Lennon, Paul McCartney and George Harrison to fend for themselves. (Don't worry about them; they were going to be fine...) The group had played at the popular Casbah Coffee Club in Liverpool, England in a show that Brown was unable to perform due to a heavy cold. McCartney felt that Brown should not get a share of the performance fee since he did not perform. Lennon and Harrison sided with McCartney and so Brown quit the group. 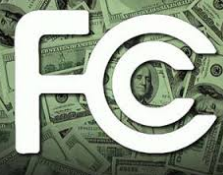 In 1970...The Federal Communications Commission (FCC) head, Nicholas Johnson, responded to recent comments made by Vice President Spiro Agnew that attacked radio stations for playing songs that contained "drug culture propaganda... (in) too many of the lyrics the message of the drug culture is purveyed," saying, "If we really want to do something about drugs, let's do something about life... The song writers are trying to help us understand our plight and deal with it. It's about the only leadership we're getting. 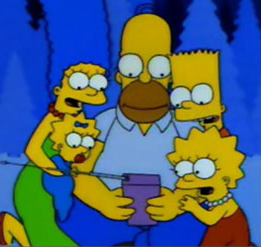 They're not really urging you to adopt a heroin distribution program, Mr. Vice President." In 1973…U.S. Vice President Spiro Agnew pled no contest to income tax evasion, then resigned. 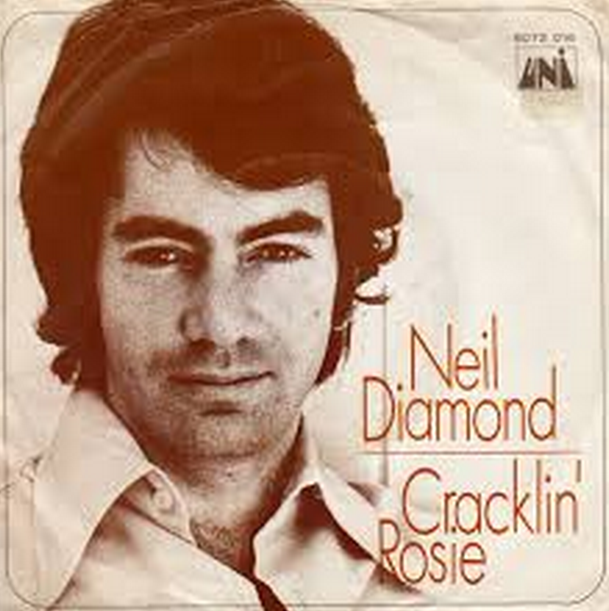 In 1970...The hot 100...1970: Neil Diamond sipped his way to #1 with "Cracklin' Rosie" but the Jackson 5 were hot in pursuit with "I'll Be There". "Candida" moved to #3 for Dawn while the previous #1 from Diana Ross--"Ain't No Mountain High Enough" came in fourth. Newcomer Free was up from 10 to 5 with "All Right Now". The rest of the Top 10: "Julie, Do Ya Love Me" by Bobby Sherman, CCR's double sided "Lookin' Out My Back Door"/"Long As I Can See the Light", Sugarloaf had their song "Green-Eyed Lady" in the Top 10, the Carpenters moved from 18-9 with "We've Only Just Begun" and Rare Earth was at 10 with "(I Know) I'm Losing You". 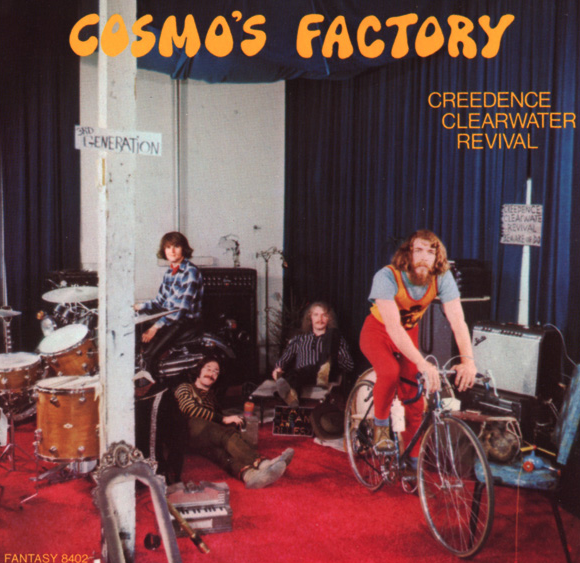 In 1970...The Album Charts..1970: CCR set the pace on the Album chart for the eighth straight week with Cosmo's Factory. Mad Dogs & Englishmen by Joe Cocker was second with the Moody Blues making a healthy move (7-3) for their album A Question of Balance. The "Woodstock" Soundtrack dropped to 4 and the Third Album from the Jackson 5 catapulted from 12 to 5. The rest of the Top 10: Tommy from the Who, Chicago II, Abraxas debuted at #8 for Santana, After the Gold Rush by Neil Young and James Taylor first hit it big with the album Sweet Baby James. In 1998…Announcer (WNYC-New York starting in 1937, Arthur Godfrey's radio and TV shows for nearly 14 years starting in 1945)/commercial spokesman (Chesterfield cigarettes, the original Kellogg's Tony the Tiger)/radio newsman (Mutual Broadcasting System in the 1960s) Tony Marvin died at age 86. In 2003...conservative talk-show host, Rush Limbaugh, admitted to his audience of 20 million listeners that he was addicted to painkillers and would be entering rehab for 30 days. Seattle's Marty Riemer, whose near perfect radio voice has been part of the audio consciousness of the northwest for decades is returning to radio, according to the West Seattle Herald. In a bit of a turnabout Jodi Brothers Blau who served as Riemer's co-host on his show on The Mountain 103.7 FM is the host this time on iHeartMedia's KJR 95.7 FM / The Jet. The morning show airs from 6am to 10am weekdays. "We start together on January 5, 2015," Riemer said. " Until then I will make sporadic appearances on the show which she will be hosting solo and with guest hosts. I will also be bringing back the 7:20 Funnies .. reason enough to tune in." Riemer was let go by The Mountain in 2009 and then brought back on a tide of positive public sentiment. Then after Riemer famously left The Mountain by choice in 2012 he continued his Friday morning podcasts and his audience grew. When he left The Mountain, he was verbally respectful, by contract, but his disdain for what the state of radio, at least at The Mountain had fallen to was obvious. That station has since gone through a dramatic makeover. 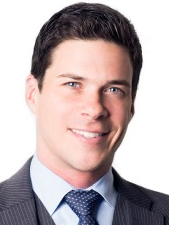 Riemer is upbeat and typically comical about his new gig. "I couldn't be happier. While I am skeptical of any venture that involves me, somehow with Jodi 1 + 1/2 = much greater than 2 (try to figure that math). In short, she and I were meant to be together professionally. Personally, we'd kill each other." 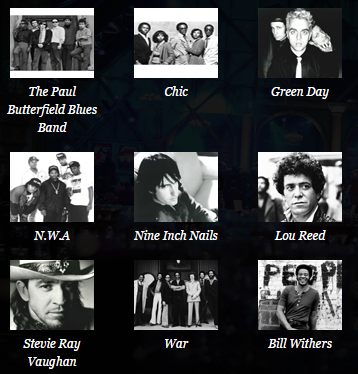 The Rock and Roll Hall of Fame will again offer fans the opportunity to officially participate in the induction selection process. Beginning today and continuing through December 9, 2014. 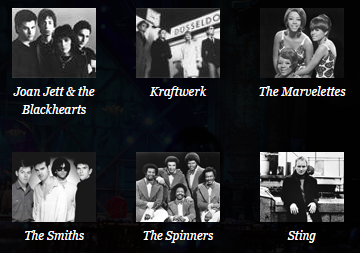 The top five artists, as selected by the public, will comprise a “fans’ ballot” that will be tallied along with the other ballots to choose the 2015 inductees. Shazam and Sun Broadcast Group today announced they have entered into a new digital partnership, in a groundbreaking move to change how listeners consume and interact with radio. The partnership will enable the launch of Shazam’s latest platform integration, Shazam for Radio. Shazam for Radio will be a full-service localized product provided to stations, allowing them to create totally customized, interactive content for their listeners and advertisers. Shazam will also power all of Sun’s national programming allowing listeners to get second screen content live and in real time as they listen to the radio. In addition to the local and national interactive content, Sun and Shazam will be producing hyper-local national countdown shows for multiple formats based on unique Shazam results in each station’s market. The Shazam Top 40 will also contain interactive content allowing listeners to connect with the show using Shazam on their phone and desktop. 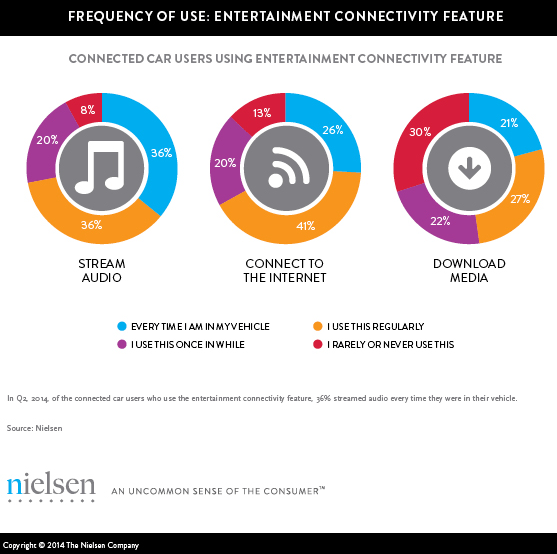 The modern car offers some form of connectivity for everyone—and that appeal is growing, aaccording to Nielsen. .In fact, of the 44% of future auto intenders who plan to purchase a new car within the next two years, 39% are very likely to purchase a connected car with built-in features. So what’s the draw? In most cases, it comes down to having what’s cool: 60% of future auto intenders say they’d like a connected car because they want to experience emerging technologies, 58% feel it will provide entertainment to passengers while on the road, and 43% say it will boost their productivity while they’re on the road. The rise in connectivity options—whether for getting directions or checking engine diagnostics—also presents a unique opportunity for advertisers and marketers to reach consumers in the comfort of their own cockpits. So who is the connected car user? The study found the majority are men (58%), 42% are age 55+ and 62% have at least a college degree and 37% made more than $100,000 per year. More still, is the added convenience that connected cars can afford to drivers who spent ample time in their vehicles. In fact, 37% of connected car users say they spend 30 minutes to an hour in their cars on a regular basis. Emmis Communications Corporation to reported radio net revenues for the second fiscal quarter were up 15%, from $41.2 million to $47.6 million. This includes reported revenue from New York's WBLS 107.5 FM and WLIB 1190 AM, which Emmis began operating pursuant to a Local Marketing Agreement ("LMA") on March 1, 2014. On a pro forma basis, assuming results for WBLS and WLIB were included in the same quarter of the prior year and consistent with Miller Kaplan reporting, which excludes barter revenues and syndication revenues, Emmis' radio net revenues would have been down 1.7%. This compares favorably to local radio market revenues, which were down 5.1% during the fiscal quarter on the same basis. Publishing net revenues were up 3% in the second fiscal quarter, driven by higher advertising rates and an increase in custom publishing business. For the second fiscal quarter, operating income was $12.5 million, compared to $5.7 million for the same quarter of the prior year. Emmis' station operating income for the second fiscal quarter was $15.2 million, compared to $14.2 million for the same quarter of the prior year. "While the summer months were challenging for the radio industry, our employees once again delivered revenue share gains. In addition, our most recent ratings significantly outperformed during September, highlighted by Power 106 holding the top spot in LA with both 18-34 and 18-49 audiences," Jeff Smulyan, President & CEO of Emmis said. "Pacings have improved, looking much stronger for the fall than the summer. Momentum is continuing to build for NextRadio, the Emmis-led industry initiative to make FM broadcast radio available on smartphones and tablets, as we approach 1 million downloads. Average time spent listening per NextRadio session is 50% higher than the radio broadcasting industry average, and as we have gained significant broadcaster involvement and increased listener satisfaction, we are seeing increased interest from other carriers, handset makers and automakers." Salem Communications Corporation announced today the retirement of veteran senior executive Greg Anderson. Capping a 44-year career in radio, including the last 21 years at Salem, Greg will step down as President of the Salem Radio Network, effective December 31, 2014. "Launching a new national radio network to serve Christian and conservative audiences was no small undertaking. When I appointed Greg Anderson to lead this effort, I had enormous confidence in his vision, experience, and determination. Today I can say that Greg surpassed even my own high expectations. He is, without question, one of the finest radio professionals I have ever worked with." The Salem Radio Network comprises Salem's nationally syndicated news, music, and talk programs, along with Salem Media Reps & Vista Media Reps -- the only media rep firms specializing in Christian, family-themed, and conservative media. "Looking back I have been incredibly blessed to work for great radio stations and great media companies including, for the past 21 years, Salem Communications. I am particularly indebted to Ed Atsinger and Stu Epperson who have supported me along the way in the creation and growth of our national businesses. Most of all I am in awe of the Salem National team who stop at nothing to accomplish great things year after year. They are simply the best. It's been my privilege and pleasure to have worked with them." Upon his retirement, other Salem senior executives will assume Greg's responsibilities. Longtime Chicago radio personality Roe Conn confirmed Wednesday that he has been dropped as afternoon host by WLS 890 AM after 25 years at the station, and that he was being replaced by Steve Dahl. 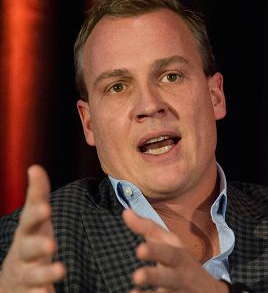 Conn and co-host Richard Roeper were abruptly pulled off the air as of Wednesday – with several months remaining on their contracts. 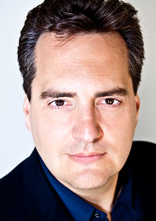 Meanwhile, Cumulus Media, which owns WLS-AM, confirmed that Dahl will take over the afternoon shift beginning Nov. 3. Speaking on ABC 7’s “Windy City Live” Wednesday morning, an emotional Conn told viewers that both he and Roeper were told they would no longer be on the air at WLS-AM, effective immediately. Conn said the decision caught him by surprise “a little bit.” He used his television platform to thank and say goodbye to his radio listeners. The first Chicago radio gig for Conn was as midday producer and then co-host for WMAQ 670 AM, beginning in 1986. He joined WLS in 1989 as a weekend host for the station, then owned by ABC Radio. In 1991, Conn was elevated to weekdays as host of the midday shift. He moved to afternoons in 1996, where he initially teamed up with Garry Meier – Dahl’s former on-air radio partner. Conn began co-hosting the radio show with Roeper, a Sun-Times columnist, in 2010. When Radio-One pulled the plug on News92 on KROI 92.1 FM Wednesday it meant 47 employees, from news anchors, traffic reporters to sportscasters, must face an uncertain future. The Houston Chronicle reports among the longtime journalists let go were longtime radio news anchors J.P. Pritchard and Lana Hughes, former KRIV (Channel 26) anchor Mike Barajas, traffic reporter Lanny Griffith and sports anchors Craig Roberts and Jorge Vargas. Employees were notified shortly after 9 a.m. Wednesday that the news format was being dropped and the station rebranded - for the moment - as B921 All-Beyoncé. Several employees gathered at an area pub to trade phone numbers and email addresses and to toast what they felt was a successful, if not profitable, three-year run. After losing millions of dollars and posting three years of anemic ratings, the news watch stopped yesterday on “News 92” KROI. Radio One made a valiant effort to bring Houston its first all-news FM, sparing no expense to assemble a seasoned staff of well-known local anchors, reporters, writers and producers, including J.P. Pritchard and Lana Hughes, morning news anchors for 27-years at “News Talk 740” KTRH. The company spent aggressively on TV and outdoor marketing. But despite seemingly doing everything right, KROI consistently ranked in the bottom tier of the market in the ratings. “People in Houston haven’t shown an appetite for FM news,” radio division president Chris Wegmann tells Inside Radio. Austin Radio: KOKE Launching News Dept.